Total quality management is the one known to be consisting of some organization-wide efforts put in order to install and to make some climate in which this organization can continuously improve its ability to deliver the high-quality products and services to its customers permanently. There are no widely agreed-upon approaches within the total quality management activity, that is why all the efforts are known to be drawing heavily on the previously developed techniques and tools of the quality control. Enjoying a widespread attention during the late 1980s as well as the early 1990s before being overshadowed by ISO 9000, Six Sigma and Lean manufacturing, TQM is still a very popular term, especially in the organizations that are focused on making the high-quality goods. Having no widespread agreement as to what time quality management is as well as what the exact actions that it actually requires of organizations, there is a review of the original United States Navy effort that gives a rough understanding of what it is. Thus, the key concepts in the TQM effort that are undertaken by the Navy in the 1980s include such statements as the quality should be defined by the customers' requirements, top management has the direct responsibility for all the quality improvement and that the increased quality may only come from a systematic analysis as well as a systematic improvement of different work processes within an organization. Also, the quality improvement within the total quality management definition is known to be a continuous effort as well as a conducted throughout the organization. The Navy used such tools and techniques as the so-called “PDCA cycle” in order to drive different issues to resolution, the ad hoc cross-functional teams that are known to be similar to the quality circles which are responsible for addressing all the immediate process issues, etc. The previously mentioned techniques used within the TQM also involve arranging the cross-functional teams taking the responsibility for the improvement of the different processes over the long term as well as managing the active participation through steering committees. Use of the Seven Basic Tools of Quality for analyzing all the quality-related issues can be an option to go for. Having the need of creating the drawing that may help solve the problems the managers face there is always an opportunity to get a very useful and professionally developed diagramming and drawing software such as the ConceptDraw DIAGRAM one. 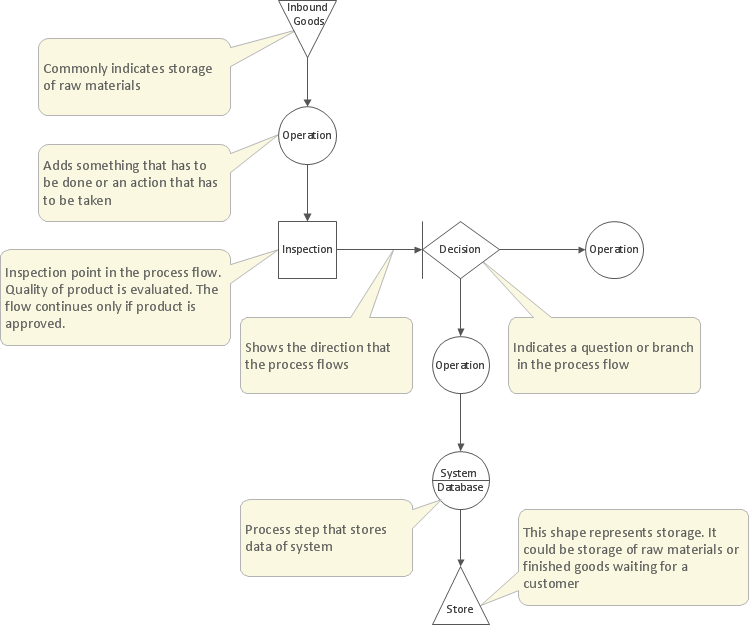 The Total Quality Management (TQM) Diagrams Solution is one of many that are available to be downloaded from the ConceptDraw STORE application to be used for making the TQM diagrams as well as many other schemes. The Seven Basic Tools of Quality is simply a designation that can be given to some fixed set of different graphical techniques that can be identified as being most helpful in troubleshooting issues being related to quality. Being called “basic”, they are suitable for all those people who do not have as much formal training in statistics. Also, they are called as “basic” for a reason of them being used for solving the vast majority of quality-related issues. All seven tools are cause-and-effect diagram (it is also known as the Ishikawa or "fishbone" diagram), check sheet, control chart, histogram, Pareto chart, scatter diagram and flow chart (also known as “run chart”). 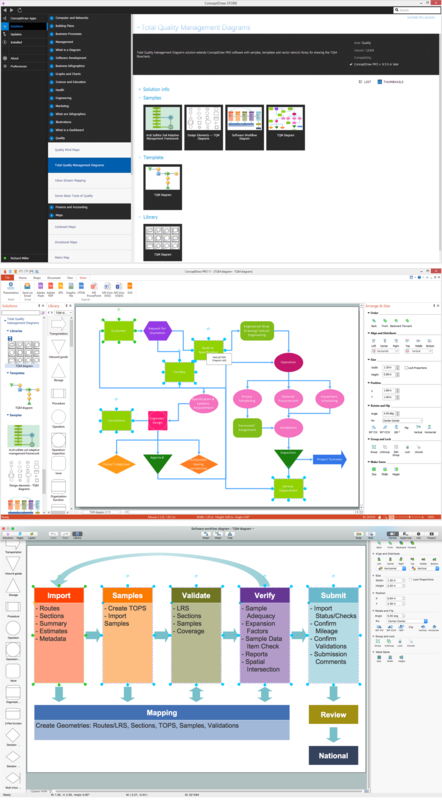 Making any of the mentioned drawings with the help of the ConceptDraw STORE application, and the Total Quality Management (TQM) Diagrams Solution in particular, can take only a few minutes as using all the previously created templates is easy making the new charts in this way. Some of the TQM tools were possibly introduced by Kaoru Ishikawa who was known to be influenced by a series of lectures of W. Edwards Deming that had been given to the Japanese engineers and scientists in 1950. At that time, those companies that had some problems in training their workforces in a statistical quality control were found that the complexity of the subject intimidated the vast majority of their workers scaling back the training in order to focus on the simpler methods which suffice for most quality-related issues. The Seven Basic Tools are known to be standing in a contrast to more advanced statistical methods. Such methods may be surveyed sampling, statistical hypothesis testing, the design of experiments, acceptance sampling, multivariate analysis and other During the 1990s, most of the standards bodies from Belgium, Germany, France, the United Kingdom and Turkey attempted to standardize total quality management. While many of the mentioned standards have since been already withdrawn, they all are still effectively superseded by ISO 9000.methods that were developed in the field of operations research. The Project Management Institute is known to be referring the Seven Basic Tools in A Guide to the Project Management Body of Knowledge. It was done to make an example of a set of the most general tools that were accepted to be useful for controlling and planning the project quality. During the 1990s, most of the standards bodies from Belgium, Germany, France, the United Kingdom and Turkey attempted to standardize total quality management. While many of the mentioned standards have since been already withdrawn, they all are still effectively superseded by ISO 9000. The definition of the total quality management was given in this article but to actually get down to making the needed TQM drawing, such as a TQM diagram, all the needed tools can be found in the Total Quality Management (TQM) Diagrams Solution from the ConceptDraw STORE application to be used in the ConceptDraw DIAGRAM diagramming and drawing application. Ultra high frequency (UHF) is the ITU designation for radio frequencies in the range between 300 MHz and 3 GHz, also known as the decimetre band as the wavelengths range from one meter to one decimetre. Radio waves with frequencies above the UHF band fall into the SHF (super-high frequency) or microwave frequency range. Lower frequency signals fall into the VHF (very high frequency) or lower bands. UHF radio waves propagate mainly by line of sight; they are blocked by hills and large buildings although the transmission through building walls is strong enough for indoor reception. They are used for television broadcasting, cell phones, satellite communication including GPS, personal radio services including Wi-Fi and Bluetooth, walkie-talkies, cordless phones, and numerous other applications. 26 libraries of the Electrical Engineering Solution of ConceptDraw DIAGRAM v12 make your electrical diagramming simple, efficient, and effective. You can simply and quickly drop the ready-to-use objects from libraries into your document to create the electrical diagram.